Financial aid originates from a wide variety of sources committed to advancing higher education; especially among certain student groups. Merit-based scholarships, in particular, reward students for outstanding achievement in athletics, academics and other scholastic disciplines. Extracurricular participation opens scholarship doors, as do community involvement and civic-mindedness. The bottom line: Students who get good grades and get involved in activities outside school are best prepared to compete for college scholarships. Organizations like Girl Scouts of the USA and Boy Scouts of America provide valuable resume entries for financial aid seekers who want to stand out. Membership in scouting organizations illustrates your commitment to excellence, and shows scholarship administrators that you are serious about education. No matter where you compete for aid, your scouting affiliation gives you a leg up - and scouting organizations, themselves, provide extensive financial aid resources for Girl Scouts and Boy Scouts making the transition to higher education. College Scholarships for Eagle Scouts are widespread - thanks to in-house funding from BSA and generous sponsorship from outside entities. NESA Academic Scholarships are valued at $3000 each. The number of scholarships awarded annually is determined by available funding. Mabel and Lawrence S. Cooke Scholarships are awarded in various amounts. Multiple gifts are issued with values of $2500 each, and the program also includes richer purses for a number of highly qualified applicants. Four students earn $20,000 awards, which are disbursed in $4000 installments, over the course of five years. One grand prize is awarded and provides $48,000 worth of assistance to a single student. Funds are distributed in four installments of $12,000 each. To acknowledge the need for highly trained workers in forward-thinking fields, the NESA offers a STEM – Science, Technology, Engineering and Mathematics – Scholarship. The $50,000 award is disbursed in equal payments over the course of each recipient’s education. United Health Foundation works with scouting organizations to provide annual scholarships worth $25,000 each. To qualify, applicants agree to work in under-served medical facilities following graduation. Five-thousand applicants compete for 150 awards annually, which are worth $1000 each. Depending where you live, your scouting scholarship pool might also include regional awards. For example, if you are a Boy Scout residing in the Northeast, consider the Carter Scholarship Grant for New England Scouts. Applications are submitted by high school seniors and winners receive $1,500 annually, for each of their first two years of college. 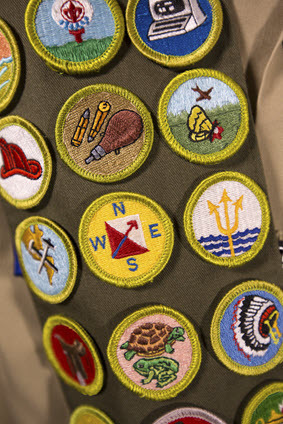 On the other hand, if you hail from the Northwest, the Cascade Pacific Council Eagle Scout Association College Scholarship may be well-suited to your financial aid requirements. Cascade Pacific Council scouts who are high school juniors or seniors are eligible to apply. Corporate benefactors and other private organizations offer valuable scholarship assistance for Boy Scouts and Girl Scouts. Eagle Scouts qualify for the $1,000 Frank D. Visceglia Memorial Scholarship, which is underwritten by the Association for Commercial Real Estate and the National Association of Industrial and Office Parks. Each award is valued at $1000. First preference for the scholarships is given to students who are actively engaged in community projects relating to the economy, or the environment. Eagle Scouts attending four-year, accredited colleges and universities are invited to apply. The American Legion supports education for scouts, with scholarships issued by American Legion Posts or Auxiliary Units. The ” Eagle Scout of the Year” scholarship is awarded annually to a top candidate. Though only one $10,000 award is given, three runners-up qualify for scholarships worth $2500 each. The Legion also offers a Girl Scout Achievement Award for high-achieving scouts who have received the Girl Scout Gold Award. The Corinne Jeannine Schillings Foundation Scholarship distributes financial aid to worthy Girl Scout Gold or Silver Award winners who plan to major in a foreign language. The Elks Foundation provides annual scholarships for Girl Scouts who have ascended to the top of the program, and earned Gold Award status. Eight worthy Girl Scouts earn $6000 each toward college. Awards are disbursed in four annual $1500 installments. Application is made through participating local Girl Scout Councils. The Order of the Arrow distributes memorial assistance like the Josh Sain Memorial Scholarship. The awards recognize exemplary service as organization leaders, and are issued based on academic achievement and other noteworthy accomplishments. Faith-based initiatives aid scouts who are devout followers of particular religions. Ethnic lineage is also a qualifier for some unique assistance for scouts. For instance, the Freeport, New York, based Eastern Orthodox Committee on Scouting offers annually scholarships worth $1000 each to winners, and $500 each to runners-up. Eagle Scouts and Gold Award Girl Scouts who are active members of the Eastern Orthodox Church, are eligible to apply if they have received the Alpha Omega Religious Award. The Frank L. Weil Memorial Eagle Scout Scholarship, administeredby the National Jewish Committee on Scouting, is another culturally-sensitive award. Eagle Scouts who have earned the Ner Tamid emblem may apply for one of three available scholarships. Winners earn $1000, while runners up qualify for $500 each. Albright College in Reading, Pennsylvania, offers a number of $500 scholarships (renewable up to four years) for Boy Scouts. Additionally, the school provides one $500 scholarship annually to girl scouts who have earned the Girl Scout Gold Award. Lebanon Valley College offers a similar Girl Scout Gold Reward of up to $2,000 - disbursed over the course of a four-year education. At Texas A&M University, Corps of Cadets Scholarships for Scouts are awarded each semester, to 20 scouts who enter the Corps. Syracuse University maintains a United Radio Service Endowed Undergraduate Scholarship Fund in Engineering, which funds awards for Girl Scouts and Eagle Scouts. In Missouri, Columbia College offers $500 scholarships for Eagle Scouts. At prestigious Stanford University, Eagle Scouts earn Dofflemyer Honors Scholarships which are primarily need-based awards.